Editor’s note: this guest post is the first in a short series by Ankit Khandelwal, a prolific student of online courses. This article covers ways to use freely available materials to develop confidence and competence in business management skills outside of a traditional degree program. You may have heard of the term strategic planning – “an organization’s process of defining its strategy…and making decisions on allocating its resources” (Wikipedia). If you are enthusiastic about business like me, this can become a core part of your day-to-day life. If you are aiming to study business strategy using online courses, with limited resources of time and money, then this post can be helpful to you. Based on my experiences, I present an alternative angle to understanding strategic fundamentals, maximizing your learning from online courses and practicing your knowledge in real life situations. In the very first part, I will describe my own way of looking at strategy, share some easy yet often ignored resources of energy, and offer a small piece of advice. In subsequent posts, I will add more information related to courses, projects and some other usage to help you maximize your learning. We all make plans in our daily lives for doing small and big things, whether planning a trip, buying a car, or choosing a budget-friendly restaurant. Most of the time, our plans consist of evaluating various options before us. We take account of different factors associated with our decision, do some profit and loss analysis and sometimes also take the long term into account. If you are a person who does these things fairly often, then you might have the mindset required to be a business strategist. 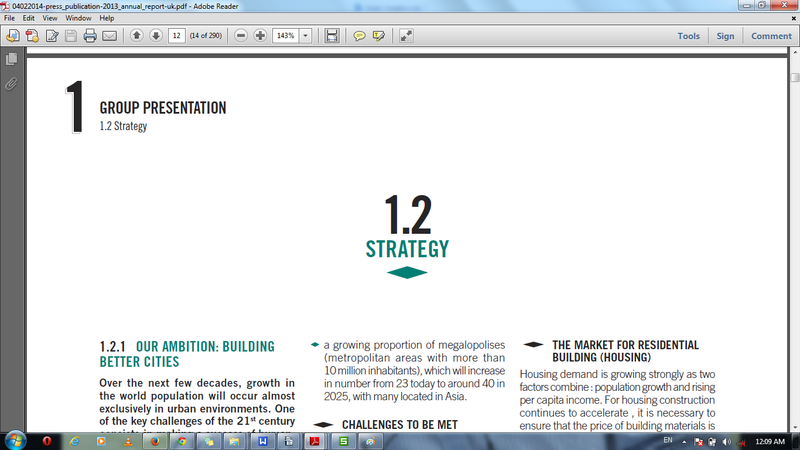 Now, if ‘planning = strategy’, does this automatically mean that being a planner makes you a strategist? Not really, there are very real differences. When planning for a vacation trip, you are planning for yourself or your family. But what if there are more than ten people involved? Must you account for a lot of uncertainty? What if you must think one to five years into the future with all of the uncertainties and challenges involved? Moreover, what if many more people will be competing for the same market? Do not be frightened just yet; you have only just got a taste of what it is like to design a business strategy! There are many ways strategic thinking can be developed. Given limited resources, my general method involves freely available reading such as news items and annual reports. This is a readily available resource. If you are new to the business world, start reading business news on regular basis. Explore what is happening in the market, follow individual companies, and keep tabs on the long term forecasts. Once you are comfortable with your sources, learn to pick up on the sectors that interest you. For example, of these two figures, one highlights recent activity in the Oil & Gas sector, one of my interests. 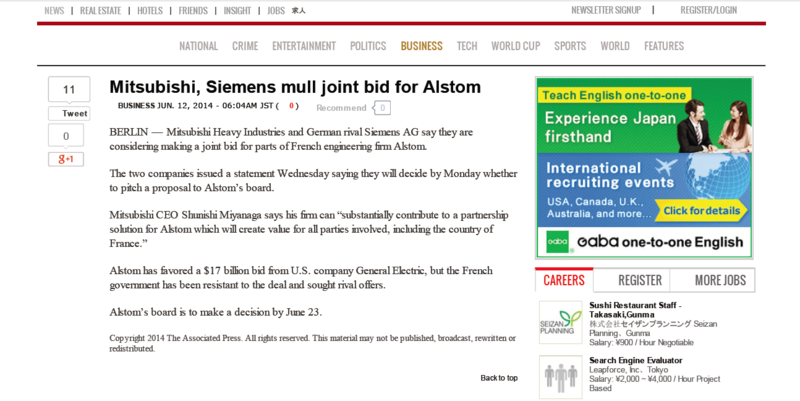 A recent report on Mergers and Acquisitions in newspaper Japan Today (www.japantoday.com). Recent report about activity on Oil and Gas sector in Reuters (www.reuters.com). With every business news story, consider the long term impacts, other sectors that will be affected, changes to the company, operations, profits, employee profile, etc. Keep records of this information, which well help you to track changes in a particular sector and to develop your own informed thinking. Remember, too, that you can gather information from other sources, like blogs from thought leaders and radio/television programs, depending on your interest and time. Follow a source for a few weeks to learn its style, content, and value to your interests. As your develop your own expertise, you will naturally begin to think more strategically. Most publicly listed companies release annual reports. These provide useful insight into a given organization, including the activities of the past year, future plans and identified challenges that lie ahead. Pick any company which is publicly listed and then search for the information on the Web; generally, you can also find reports easily by browsing or searching the company’s website. 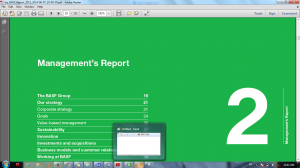 A company’s annual report contains a number of distinct elements and summaries. If you are primarily trying to think like a strategist, you can pick the annual report from any year and read the portion that focuses on strategy. To go deeper, my advice is to read at least the past five or six years of reports to understand what measures a company adopted, what paths were chosen, which steps were taken – and which steps were not. One challenge is that the word “strategy” might not show up in some reports. Strategic planning can appear under different names: long term growth plans, competitive structure, innovative ideas to increase revenues, management focus areas, etc. Below, I have selected some different examples for you from my previous readings to give you a glimpse into how different companies communicate strategy. 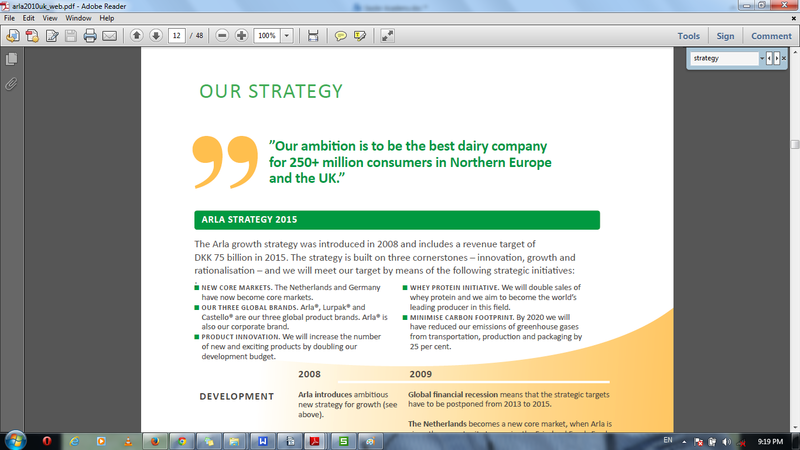 A section of an annual report from Arla (www.arla.com). 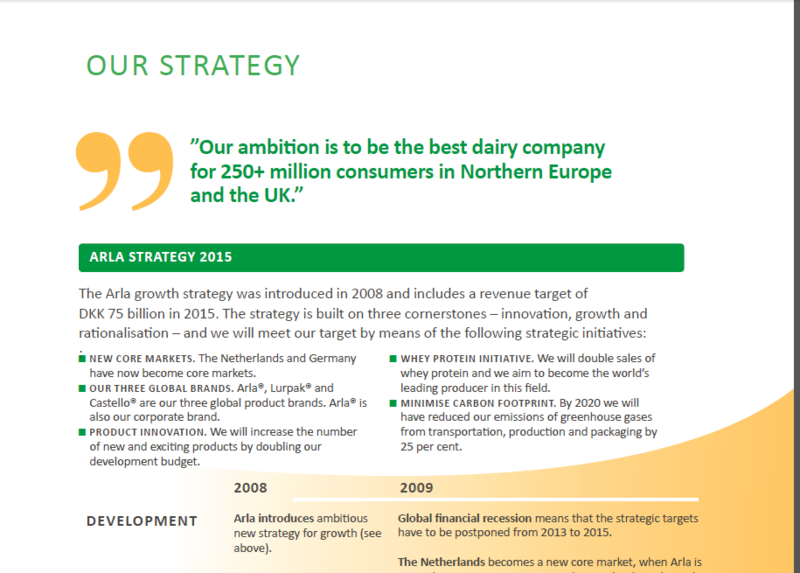 A section of an annual report of Lafarge (www.lafarge.com). A section of an annual report from BASF (www.basf.com). Note that you can also follow company updates more frequently, e.g. on a quarterly or semi-annual basis – see what reports a given company offers on its website. If you do this exercise regularly, within a few months you will become an expert at understanding market trends and company updates. Remember, plenty of self-discipline is needed to read long reports and critically engage with the information using the “5 W’s” and putting everything in the proper context. Now, you are ready to study more about planning strategies through courses (online/offline) and other tool-kits. In my next blog post, I will explain how to use them effectively. My name is Ankit Khandelwal. 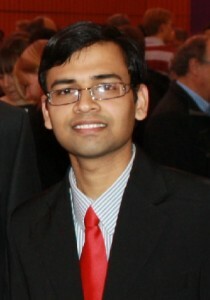 I am from India and a master’s graduate in Chemical engineering from Technical University of Denmark. From May 2012 to June 2014, I worked on my ‘Envisioning 21st century global manager’ project. It was my own invented project, drafted after careful analysis of my interests, future market trends and required skills set to become a global manager/leader in the 21st century. As part of this project, I have taken courses from MIT-OCW (Open Courseware), OEC (Open Education Consortium), OYC (Open Yale Courses), OLI-CMU (Open Learning Initiative- Carnegie Mellon University), as well as from other organizations and MOOC providers (WTO, Copenhagen Business Center, Alison, Coursera, edX, NovoEd, Open2study). Over the past two years, this was my full time work, comprising 20+ courses from different universities (covering general management disciplines as well as interdisciplinary aspects such as trade negotiations, urban planning, public policy, environmental law, functioning of non governmental organizations and EU, design thinking, disaster preparedness, and self-study in three foreign languages, etc.). I have extensively studied newspapers from different world regions to get regular updates on business and market trends while expanding my networks through projects and other outreach. Equally important has been my study of different cultures to grasp local social and political characteristics in my effort to prepare myself for negotiating/working in a multicultural global environment. We have a new address!Care to share?